One of the amazing aspects of innovation is how different people can approach the exact same problem from completely different angles. The social media has seen hundreds of startups including recent popular apps such as Viber (voice calls), Periscope (video streaming) and Snapchat (disappearing photos that has filed for an IPO at a valuation of $25 billion), whose founders all wanted to facilitate the creation of virtual communities. Yet their technology solutions take wildly divergent paths to the same goal. A number of startups have launched with the goal of helping Millennials & Centennials become comfortable with investing. There has been some out-of-the-box thinking in the development of two apps: Acorns and Stash. Both apps fall into a category known as “micro-savings”: enabling users to save small increments at a time, perhaps even less than $1.00. But which is here to stay? Acorns has gained an impressive user base, especially when compared to name brand roboadvisors like Betterment and Wealthfront, who’ve spent millions on advertising. But Stash is making headway with their customizable approach to building a nest egg. Let’s take a look at how the two micro-savings apps compare. Acorns users can invest their spare change through the app’s automated system. Once you link an account, all of your purchases are automatically “rounded up” to the next dollar, and the spare change is invested in a pre-defined basket of ETFs. For instance, if you buy a cup of coffee for $2.50 using your credit or debit card, the app rounds it up to $3.00, and then it invests the leftover $0.50 for you automatically. Acorns’ slogan, “Investing for everyone,” is fitting, considering their goal is to appeal to non-investors. By enabling users to set up and forget about an investment account, they encourage people who may never would have invested otherwise to start. There are few apps that deal in such small investments. Stash, unlike Acorns, is one, but it does not automatically pull money from an account; the user has to be the one to set up a transfer. However, Stash offers more flexibility, particularly in the ETFs users are given access to, making it attractive for investors who want more control. 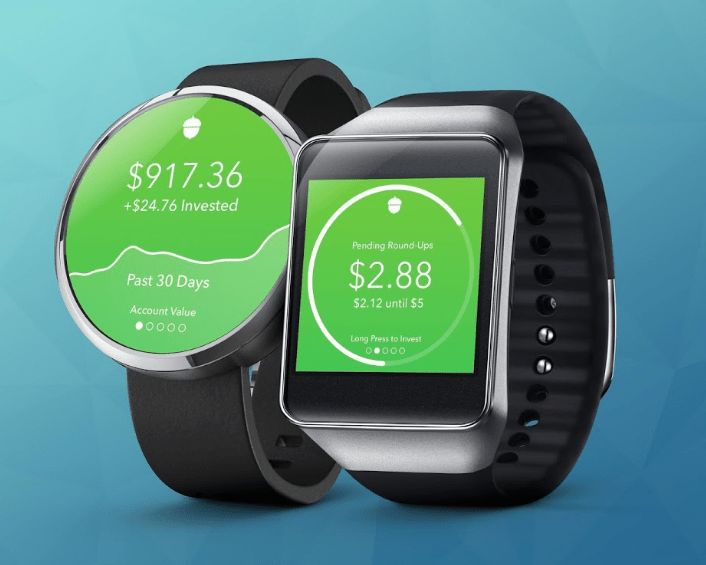 Acorns syncs with iPhone and Apple Watch, as well as Android and Android Wear. It now also has a desktop site, which was a new addition to the last update. The wide-reaching appeal of Acorns stems from the fact that users, once they’ve set up an account, don’t have to do anything. After it calculates your risk tolerance by asking you questions about your age, time horizon, income, goals, etc., the app recommends one of six portfolios, which range from Conservative to Aggressive. Users can accept the recommended portfolio or select their own. The portfolios are comprised exclusively of ETFs from the likes of Blackrock and Vanguard, and your roundups are automatically invested for you. This is similar to other roboadvisors. This program has been so successful that there has been an estimated more than a 50% lift in transactions for Acorns customers on average. And if you were already going to make a purchase with a brand in the first place, it might be worth checking Acorns to see if there’s a worthwhile Found Money reward to redeem. 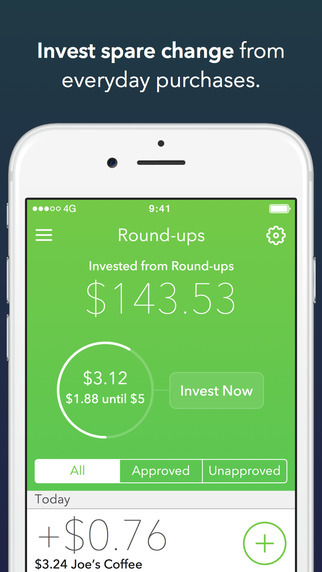 Acorns is one of the few investment apps to have versions for mobile, desktop, and wearables. Stash only has a mobile version, making it less accessible for users. Because of Acorns’ Found Money program, users may find the iPhone app screens a little cluttered with offers. Some people may like that more than others, though, and like a credit card website, the offers are easy enough to avoid. 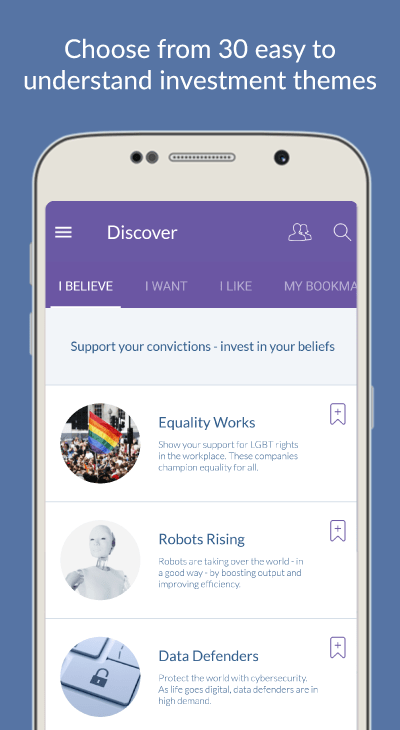 The inclusion of Acorns Grow, the app’s standalone web publication offering money and career advice, is unnecessary for the app. The website offers plenty of useful advice, but its main purpose is to convert readers into Acorns users. Why would people who have already downloaded and started using Acorns need it? The Apple Watch app screen is cleaner, focusing on the money you have in the account and the roundups you can invest right now. By placing the focus on the total amount you have invested, it solidifies Acorns as a good money-saving app. The new update also included a “Performance” screen, so you can easily see your portfolio gains and losses over time. There is also now an easy option to invest immediately via the Smartwatch app. Most of this massive growth is likely due to the automated investing functionality; users like that they don’t have to do anything to use it after it’s been downloaded. In fact, with the focus on setting aside “spare change,” it seems to act as more of a savings app than an investment one. One could argue that, since apps like Acorns and Stash are taxable, young people are much better off focusing their investments on a retirement account. So far, Acorns has received just under $62 million through six rounds of funding, according to Crunchbase. That is pretty substantial compared to Digit’s $36 million and Lawnmower’s measly $105K. The most recent round was for $30 million in April 2016, which was led by PayPal. Acorns has thus far gained 12 total backers, including e.ventures, who most recently backed PayKey, and Greycroft Partners, who most recently invested in the home-selling platform Knock. Acorns charges users $1 per month for balances under $5,000. Once they’ve surpassed $5,000 in their account, the annual fee is 0.25%. It has several promotions, such as being free for students (who’ve been confirmed with a valid .edu address) for up to four years from the date they opened an account. Users are required to have a minimum of $5 to start investing. We can make an educated guess that, with 1 million users paying at least $1 per month in fees, Acorns’ revenue has at least hit the $12 million mark. To put that in perspective, Wealthfront has an AUM of $4.35 billion, and charges 0.25% annually, meaning their revenue is an estimated $10.875 million. Betterment is a little farther ahead, with $6.1 billion AUM at a 0.25% annual fee yielding an estimated $15.25 million in revenue. Stash Invest – “investing for real people,” as its slogan says – has helped corner a market in investing. With micro-investing, growing wealth is now more accessible than ever to people of various incomes and net worth. Although users can still invest very small amounts at a time, Stash is more hands-on than Acorns. Rather than automatically allocating “spare change,” users must set up withdrawals manually. It’s also not a roboadvisor, because it doesn’t do the allocating or portfolio rebalancing work for you. Stash is currently only available on the iPhone and iPad for iOS; there’s no Apple Watch or desktop version, making it less appealing to users who want to access their investments wherever, whenever. Interestingly, Stash is currently ranked #23 among finance apps on iTunes, whereas Acorns is ranked #24. Like Acorns, Stash takes the user’s age, time horizon and goals into consideration when calculating risk tolerance, then makes recommendations. Users then have 30 or so investment options to choose from consistent with their risk level, though Stash leaves all the investing decisions up to the user. Stash’s differentiator is their offering of investment recommendations based on each user’s personal values. For example, you can decide to invest in clean energy if you care about the environment, or in municipal bonds if you want to contribute to public works. This is similar to Motif Investing, where you can select investment based on “themes,” and even entirely customize your own portfolio. And unfortunately, Stash’s functionality is simply not intuitive. The app offers a “Quick Start Guide” for users who don’t know where or how to get started. Acorns is more successful because it is intuitive. No guide is needed! Stash’s small user base compared to Acorns may be due to its lacking user experience. We recommend that, if it wants to grow substantially, Stash should aim to streamline its interface. Users clearly don’t want to put in so much guess work. Stash does not currently have a partnerships program in place similar to the Acorns’ Found Money program. It does, however, have a referral program for employers. Employers can sign up and refer their employees to start investing, giving them an opportunity to start a conversation about financial literacy – something that’s always welcome in the workplace. However, there is currently no information available on the success of this program, and whether or not it has actively acquired many new Stash users. As we mentioned, Stash does not have a version for Apple Watch and other wearables. Users also can’t access their accounts via a desktop. By limiting user access to only a phone or tablet, the app is cutting off a lot of accessibility, which may lessen its appeal. Compared to Acorns’ success, Stash seems to be lagging. Stash has acquired just over 91,000 users, with an AUM of $9.85 million. User accounts hold an average of just $108 – less than half the size of the average Acorns account. With 91,000 users being charged $1 per month in fees, we can estimate that Stash’s revenue is just under $1.1 million per year. So far, Stash has received $38.75 million from four total rounds of funding. The most recent round was for $25 million in December 2016, with Valar Ventures as the lead backer. The fee structure for Stash is almost identical to Acorns: it costs $1/month for balances under $5,000, and it applies a 0.25% annual fee for balances of $5,000 or more. Stash also has a few user promotions going on. It is currently free for the first three months, and there’s a $5 account minimum required. Users can also share the app with friends, and everyone involved will receive $5 for each referral that converts into a signup. With many more users and a much higher AUM, Acorns is certainly a more prominent micro-investment app than Stash. Thanks to its multiple user-friendly interfaces and hands-off approach to investing, Acorns is almost always credited as one of the top investment apps for millennials. It’s hard to deny the influence of an app that’s managed to build such strong brand partnerships in just a few years. With a higher average account balance than Stash, Acorns’ hands-off approach seems to be of highest value to users. We feel that the social aspect of Stash – the ability to invest in social causes and one’s values – will take on higher value once more users find out about it. Unlike us, most “real people” looking to invest aren’t going to check out every app available. You can’t deny that Acorns’ much better accessibility and word-of-mouth popularity points to a major shortcoming on Stash’s part. If Stash is serious about growing its user base, they should consider re-vamping the app to involve a more intuitive interface, as well as adding desktop and wearable versions. Bottom line: the trajectory of Acorns is looking unstoppable. 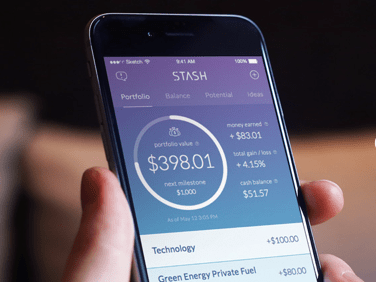 But Stash’s commitment to providing choices for where a user’s money is going may prove to more attractive to an increasingly socially-conscious generation, if they decide to make some much-needed improvements. Technology	RoboAdvisors and the DOL Rule: Perfect Together?